1752- 1814. He was the fifth of seven sons and a younger daughter of Richard Sandys of Northbourne Court, Kent, and of his wife, Susan Crayford Taylor. Sandys was commissioned lieutenant on 7 January 1773, and during 1777-8 was the first lieutenant of the Lowestoft 32, Captain William Locker, based on the Jamaican station, and on which ship Horatio Nelson was serving as a junior lieutenant. Sandys failed abysmally to meet the high standards of a young Captain Horatio Nelson, who was once his junior on the frigate Lowestoft. He was promoted commander of the fireship Tisiphone 8 in succession to the posted Captain James Saumarez in the Leeward Islands on 7 February 1782, and returning to serve in the Channel he was posted captain on 21 January 1783. Having been appointed to the Latona 38 in May 1784 Sandys took her out to the Leeward Islands, but in the following February he incurred the wrath of Nelson, who was now his senior, when the latter entered English Harbour, Antigua, to find the Latona flying the broad pennant of the resident commissioner, John Moutray, a naval officer who at the time was holding a civil appointment and had no right to assume a commodore’s position. Nelson’s fury was compounded by the fact that Sandys was not aboard his vessel, and that he also failed to pay Nelson the respects due to him as the senior officer. During this period Sandy’s desire for a local woman was not being fulfilled, and with a drinking problem becoming more extreme he was invalided home in March 1786. 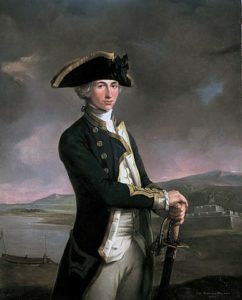 At a time when naval officers were clamouring for employment it was therefore quite surprising that he was appointed to the new Dido 28 at Portsmouth in September 1787 and after initially receiving orders for Jamaica he sailed for Nova Scotia from Portsmouth in March 1788 to become the senior officer on that station with the honorary rank of commodore. Shortly after his arrival he presided over the court-martial in May into Captain Isaac Coffin’s keeping of false musters, but he erroneously allowed the court to reach a verdict that merely removed Coffin from his ship, rather than issue the appropriate sentence which was one of dismissal from the navy. Sandys left the Dido in the summer of 1790 and was never re-employed. He became a superannuated rear-admiral on 21 November 1805, and died at Brompton, Middlesex, on 23 April 1814. In September 1796 at Cobham, Surrey, Sandys married Elizabeth Knowles, the daughter of a clergyman. Although he was a small, likeable man, and was particularly merry in his youth, Sandys failed entirely to achieve the respect of his contemporaries, and Nelson was only one of many who stated that he was unfit to command a man of war, and that his ship was in little better order than a privateer. Not only was he totally incompetent but he was also a drunkard who was sinking a bottle of claret a day as early as 1785. By the end of the decade he was a hopeless drunk, as illustrated when he was found in a stupor in his cot when no less a personage than Prince William Henry arrived to pay his respects.